Some people seek free time to go for a movie while others take some time out; some wants a theatre experience while others are okay with their laptop screens. But whatever it be, we all need recommendations for what to watch next. 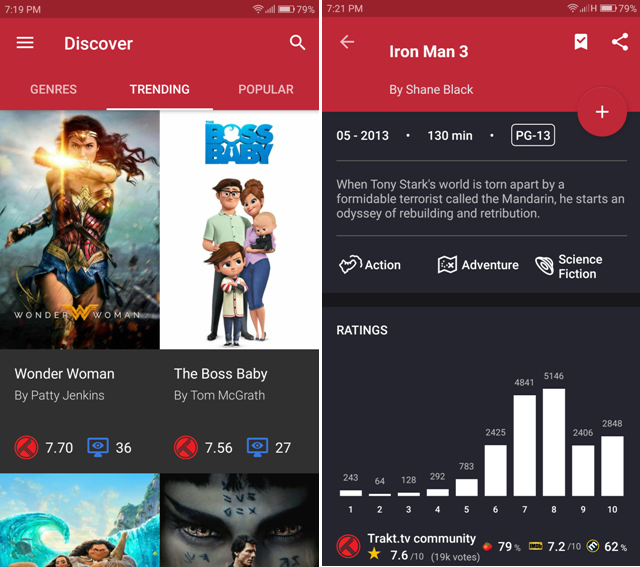 CineTrak is material designed, a no-nonsense app to find, manage, check ratings of your favorite movies and even comes with Trakt integration but first, what is Trakt? Trakt is a platform that keeps track of TV shows and movies we watch. And after signing up, putting your liked movie and TV show genre and ticking on what you have already watched it shows you how many hours of movie or how many days of TV shows who have watched. Just log in on CineTrak with your Trakt ID and it will show you recommendations, upcoming movies, top anticipated movies and much more. It shows you movie synopsis and ratings from IMDb, Rotten Tomatoes and Metacritic. The app is free, unreleased beta and we found it pretty stable, but it contains ads. The premium version which costs few dollars removes ads and gives curated and staff picked movie lists. If you’re looking for a cool looking app which recommends based on some keywords/genres like book-based, battle etc and even their mixture then this app is for you. App’s home-screen features some preset keyword mixtures like “crazy+extreme”, “love story+date” which shows the respective movies. It also gives you curated lists on the genre like artificial intelligence or sci-fi. 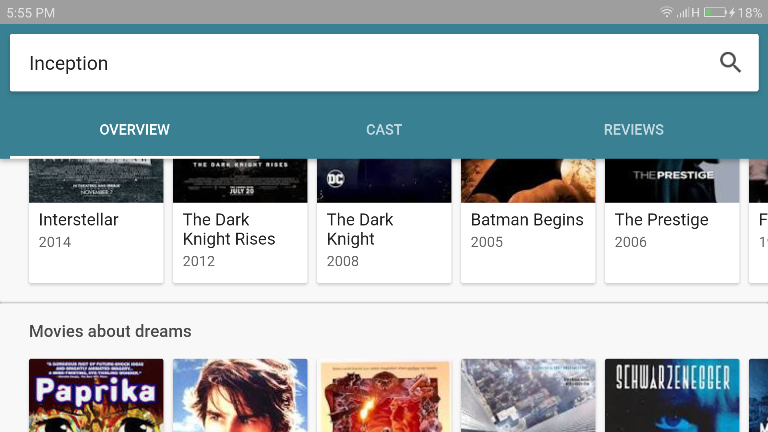 And you can always search for movies using solo keywords or mixture of them. It shows you movie’s cast, directors, and the cost with the name of streaming services. So it ever happened with you that you missed an episode of your favorite TV series or you want to know when is the next season going to release but you can’t find it out. Then fret not, Hobi is here. 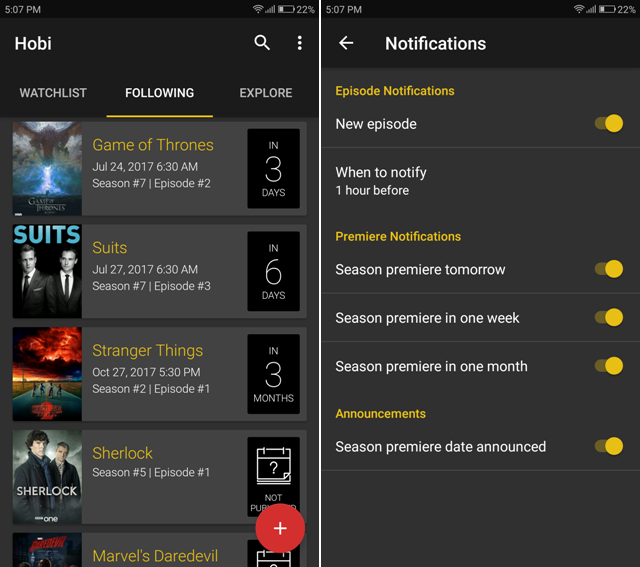 Hobi is a clean and simple app which shows you your favorite TV series next episode date, season date and every detail related to it. Just sign-up with your Google account and follow the shows and it will notify you each time a new episode or season releases. It’s free, contains zero ads and is soon going to be integrated with Trakt. 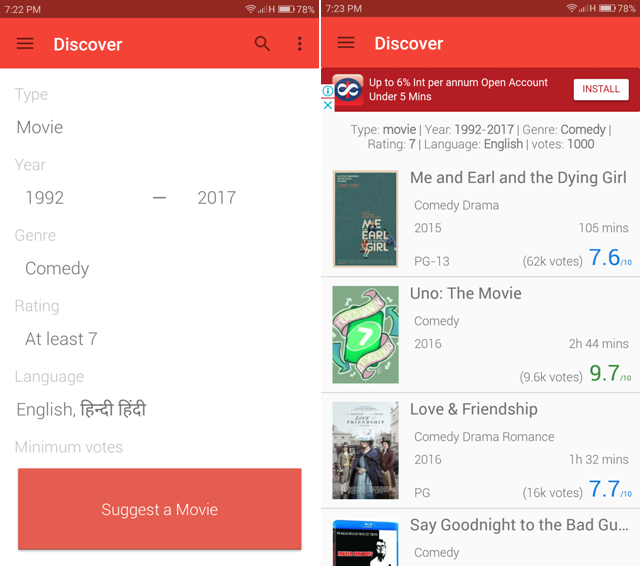 As the name suggests, this app discovers a movie, TV show or a documentary by just filling some details like the genre, the year it got released, rating and even language, meaning it shows movies of all regions and is not bound to just English entertainment. Other than that you can see the charts, new releases and you can even bookmark movies. It’s free but contains pop-up and in-app banner ads. 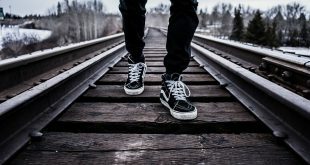 You can remove them by making an in-app purchase of few dollars. A similar app with zero ads is Movie Genie, but the only con with that its Popular Movie list is not updated and shows dated movies but if that’s not a problem for you then check that out. Are you a person who wants more about your favorite TV shows along with alerts of when the next episode is going to air? Then TV Time is a must app. Just create an account, put the TV show you’re watching or going to watch and that’s it. Now, it will show you when the next episode is going to air, community reactions, podcasts and some trending articles on TV shows. It tells you when new shows are going to come, and some personal recommendations. 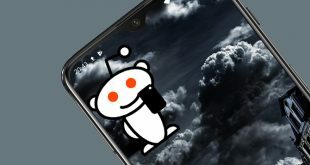 It’s free, contains zero ads and is easy to use. 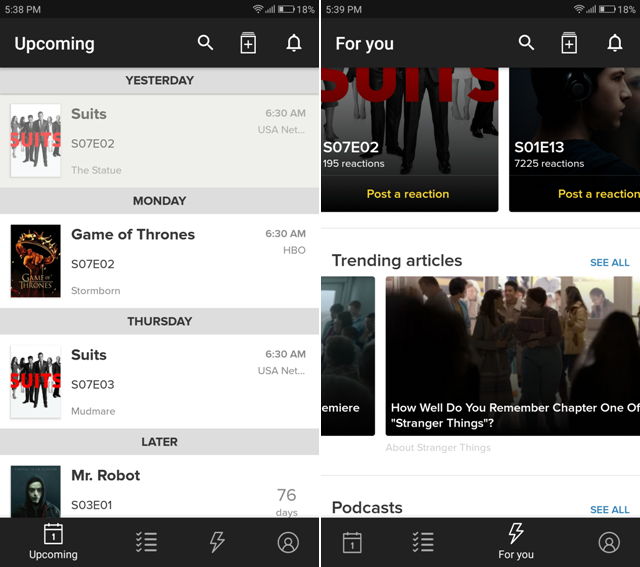 So you want just one app for both movies and TV shows needs, then you should look at SeriesGuide. The app features a clean, materialistic user interface and comes with Trakt integration. 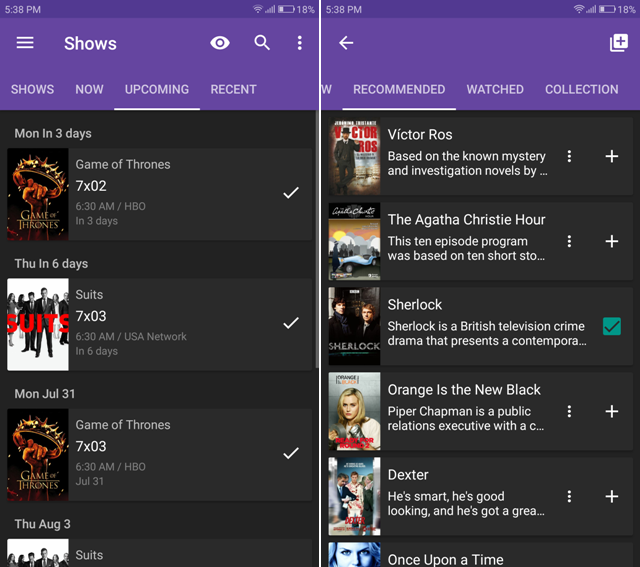 Just add the TV shows and movies you have watched, it tells you when a next episode is going to air and also gives you recommendations if you log-in through your Trakt ID. It’s free and contains zero ads. 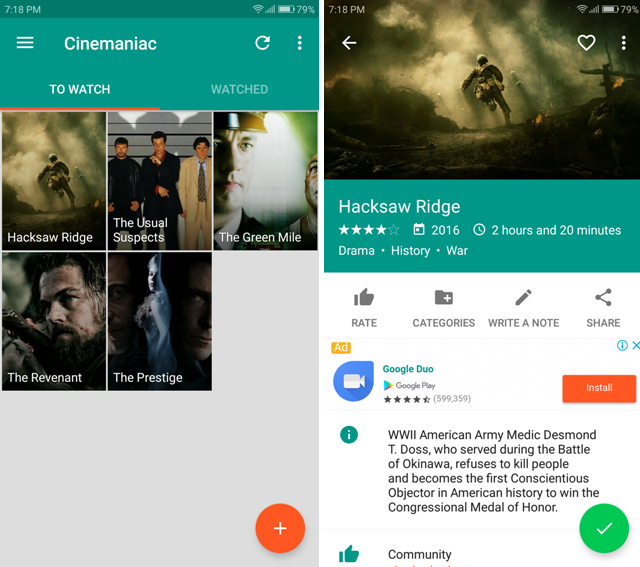 Now, enough with the movie and tv series recommendations app and now let’s look on an app which lets you find and manage your movies into two categories that are watched and to watch. This can seem like a small thing but for some people, it’s really important. You can search for movies by its name, the actor or the director. It shows movies synopsis, cast, community ratings etc. It’s free, contains ads and to remove them you have to make an in-app purchase of few dollars. 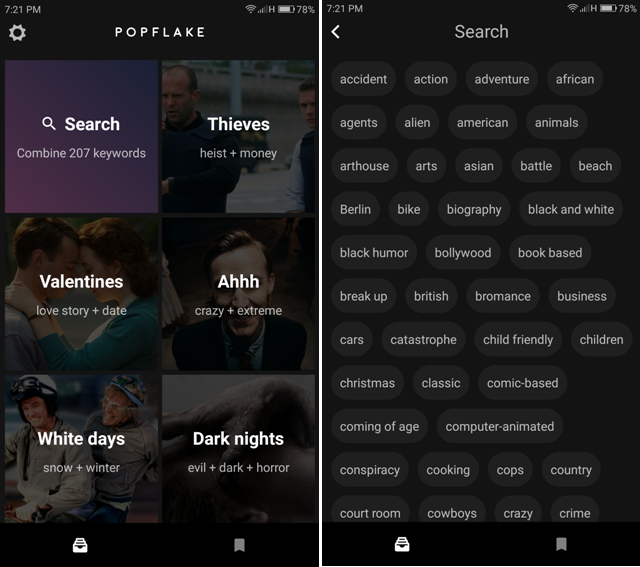 Though you can search for movies and TV shows on Quora, Reddit etc but these apps will give a more detailed and curated list. I liked Popflake and Hobi the most. Tell us which one you liked the most or if you know about any other app in the comments.